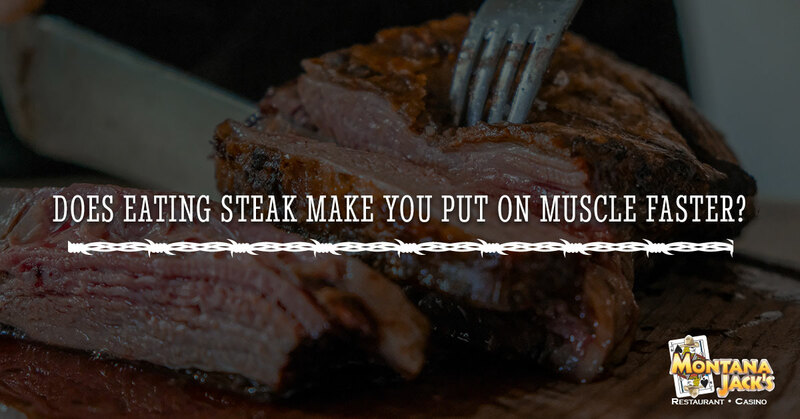 Steakhouse Billings: Does Eating Steak Make You Put On Muscle Faster? Does Eating Steak Make You Put On Muscle Faster? Is there anything quite as satisfying as eating red meat after a great work out? There’s something about the protein on your lips, the smell, the texture of the meat and the pure joy of ripping into a juicy steak. Beyond the animalistic need to reward yourself with red meat for your hard work, is there, perhaps, something more to that craving of red meat? In short, yes. Red meat is essentially the muscle building multivitamin you should always be taking — that’s why it feels great to eat it after a workout. What makes that red meat so valuable to your body’s composition as it pushes to build muscle with proteins and other organic compounds? We’re sure we don’t really need to tell you, but muscle building is all about protein, hence the proliferation of protein shakes all over the gym. High-protein foods are responsible for delivering the most simple component of muscle building: amino acid building blocks that create muscle protein synthesis. When your muscles create little tears as they’re stretched and pushed to their limit during exercise, muscle protein synthesis kicks in and starts filling in those tears with proteins already present in your body. These same protein-rich foods your body craves are directly related to your body knowing what it wants. Protein-rich foods help satiate your appetite while providing all the nutrients your body is crying out for after a workout. They also promote the thermogenesis process, or the internal calorie-burning motor you run on. Let’s just say there’s a biological reason that the smell of sizzling steak is like a drug after a hard workout. Beef, specifically, is crammed full of a very specific type of protein called skeletal muscle proteins. They go by the names of collagen, troponins, actin, and myosin and they’re the easiest for your body to synthesize because they’re exactly like our own proteins. In fact, plant-based proteins lack this benefit for the very reason that it’s harder to synthesize different protein molecules, making the muscle-building process much slower. Beef specifically is not only superior in its protein content, but it’s also rich in B12, phosphorus, iron and zinc, which are additional muscle-building compounds. The most interesting aspect of what beef delivers to the body is the creatine compound. Creatine is known as the most potent anaerobic backup energy that you body stores within your muscles. This energy is used to stretch out the ability of your muscles right when you start working out and makes you warm-up quicker. It also provides the body the ability to adapt quicker and recover faster because it promotes mitochondrial content, especially in growing muscle cells. After learning all of the extremely beneficial byproducts of eating a juicy, red steak, you can hardly argue that you shouldn’t come order a slab of beef now. When you’re celebrating with delicious red meat, and you’re hoping for a prime USDA cut of black angus, look no further than Montana Jacks in Billings. We offer the finest, healthiest meat, and we can guarantee that the science backs the muscle development you’re looking for.